The Quick Journey: Celebration... Guinnyth is 1! How did this happen? I seriously feel like I have just given birth to my precious baby. Life moves at lightening speed these days. 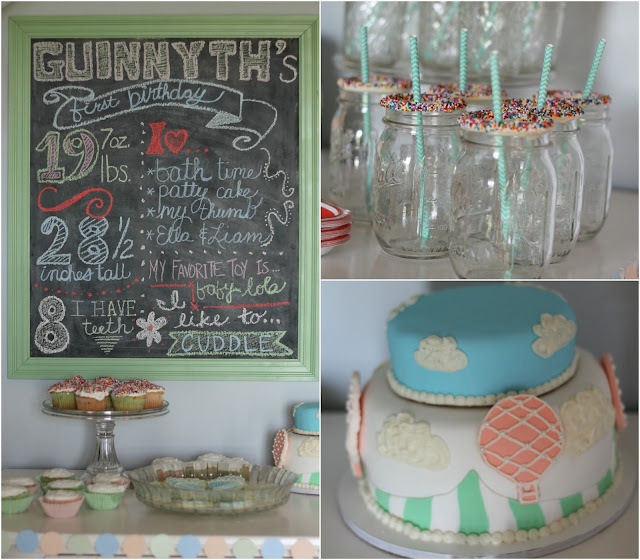 I wanted to have a sweet, simply party for my little girl. She brings so much life and sass to our little family, and I wanted to honor her. We don't do big birthdays around here much. The first birthday is the "party" birthday and from then on we keep it pretty low key. We invited immediate family (grandparents, aunts/uncles, cousins) to celebrate our little lady's life with us. I put together a hot air balloon birthday for her. I worked with muted shades of blue, green, and peach. The kids loved the sprinkled mason jars. The chalkboard took me quite a while to perfect. I wasn't totally happy with it, but at some point, you just have to move on to the next project. I had sandwiches and fresh fruit complete with a floral, hot air balloon centerpiece. Want to know what the cheapest banner ever is- a chalkboard banner! We took some family photos on our porch. Guinnyth isn't digging the pics. I think she's ready for her first taste of sugar! My sweet girl brings me so much joy. She isn't afraid to keep me on my toes either. She actually did pretty well opening presents. She got distracted, but all-in-all did fairly well. Ummm... yep. She is a big fan of processed sugar. It was a wonderful day filled with family and fun. I cannot wait to spend another year watching our little lady grow. What a cute theme idea! YAY!!! looks like it was a great party!!! Guess that means our little one's birthday is next.... YIKES!!!! Love all the decor! Love the colors! Girly but subtle! so precious! Your hair looks great curled like that!!!! Happy birthday, Guinnyth! :) Beautiful party and great photos. Happy 1st birthday, baby G! Love your style, love the decor, love all of it. How precious! What a great birthday party! OH MY WORD!! This whole party is so amazing! And I have no idea what you were talking about with the chalkboard.. . it's stunning!! also what a super cutie mom you are. i love your outfits in the photos and your obvious love for your family. i found your blog via casey's link up and am so happy i did! happy weekend, friend! You are so sweet. Thank you. You just made my day! So cute!! Just a perfect day with lovely decorations and lots of delicious food!! Thanks for sharing this over at WholeHearted Home last week.